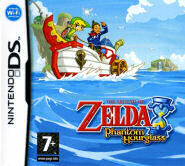 So which Zelda game did you prefer, Phantom Hourglass or Spirit Tracks? Yesterdays post showed that Phantom Hourglass greatly outsold Spirit Tracks, but does this mean that it was necessarily a better game? The folks over at Twilight Lynk have recently put up a Game Spotlight where they look at both titles side by side and decide which they prefer is the better of the two. Here is what the author of the article had to say about each game. Phantom Hourglass is an enjoyable game, but definitely not among my favourite Zelda games. The inclusion of The Wind Waker crew as well as the addition of Linebeck carried the story along for me, and the touchscreen controls and clever little gameplay mechanics were enjoyable. I’m glad we were given the chance to see where the Hero of Winds ended up after The Wind Waker. Playing Spirit Tracks is an exhausting and disappointing experience for many reasons. With games you enjoy, you don’t mind that they end up taking longer than expected to finish because you don’t really want it to end. I’ve found that Spirit Tracks is the opposite for me… it just keeps on going when I want it to end so I can get it over with already! I personally think that author is being a bit too harsh. I preferred Phantom Hourglass, but I’d hardly consider Spirit Tracks an exhausting and disappointing experience. It had its boring parts and it had its stellar parts, but from beginning to end, it surely was fun to play. Neither would be placed in my favorite Zelda games of all time, but both would be right near, if not at the very top, of my favorite Nintendo DS titles to date. You can check out the full article over at Twilight Lynk and then let us know what you think by posting in the comments below.